This church was consecrated in October 1905 by the Bishop of St Davids. Two months later, a power cut interrupted an evening service. An electrician in the congregation soon restored the lights to order. Meanwhile the hymn Lead, Kindly Light was played on the church organ! Clydach’s earlier church, St John’s, became a Welsh-medium church after the opening of St Mary’s, whose foundation stone you can see in the porch. The stone features the Fleur de Lys, symbol of the Virgin Mary and was laid in November 1904 by Martha Player, whose husband John owned the Clydach tinplate works. In memory of Martha and one of their sons, John gave the church in 1921 its stained glass east window and its alabaster reredos (screen behind the altar). The church was designed by Bruce Vaughan, a prolific architect who hailed from Cardiff. Each of the four corner pillars of the nave is decorated with an Evangelist’s carved symbol: an eagle (for St John), a man (for St Matthew), a lion (St Mark) and an ox (St Luke). The banners adorning the pillars were created by parishioners for the church’s centenary in 2005 and depict the seasons of the year and of the church. One of the windows in the south aisle commemorates the First World War dead. The west window, best viewed from upstairs, was given in memory of John Ynys Palfrey Jones, killed in France in August 1918. His father John, a medical doctor, and mother Emily lived in Twyn y Bedw Road. He gained a place to study medicine at Gonville and Caius College, Cambridge, and passed the preliminary exam before entering a cadet battalion in the city in 1917. He was a 20-year-old Second Lieutenant with the Welsh Regiment when he died. 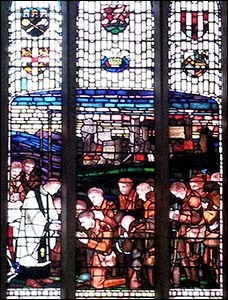 The window includes his college’s coat of arms and a priest administering the Sacrament to servicemen at the Western Front. When it was unveiled in September 1919, it was said to be one of the first church windows to depict soldiers in khaki uniform. Part of the window is shown in the photo on the right, kindly provided by Chris Bowen. See the Footnotes for more about the church and its features (opens in new window).